Only nine weeks have passed since we moved out of our house at Bournemouth to begin the Basic Phase here at Nursling, and already we have reached the end of the phase after having spent an incredible 120 hours in the Airbus A320 simulator. There has been a lot of work to complete, but in my spare time at the start of the phase I made a video of our five week Bournemouth Phase which you can watch below. The basic phase is our first and biggest module of training in the Airbus A320, comprising of twenty-nine simulator details each made up of 1.3 hours pilot flying, 1.3 hours pilot monitoring and 1.3 hours pilot observing, which is slightly more time than is usually required at this basic phase (other courses do not include pilot observing time). However, having the chance to observe each lesson as well as fly it from both the left and right hand seats has proved to be a real positive as it gives each of us time just to watch the detail back, which is great for consolidating the lesson objectives and for ironing out any trouble areas. We are crewed in groups of three and each detail begins with a 90min brief and ends with a quick debrief. Because the simulators at CTC run 24/7 there is a range of reporting times, from 4.30am to the late 8.30pm (which means finishing at 2/3am)! I am very glad to have a variety of report times because it is exactly this style of roster that we will experience at EasyJet. At first glance, such a quick transition from flying propeller aircraft to flying the Airbus simulator seemed like a formidable challenge, but after just a matter of weeks we are now completing flights confidently using the EasyJet SOPs (standard operating procedures) and handling various emergencies as a multi-crew operation. The fact that we all feel so confident with the aircraft already is a real testament to the way the MPL training is delivered, and is largely down to the fact that the entire of the basic phase consists of hands-on manual flying with very limited use of autopilot. Despite the relatively short time frame, the pace is actually pretty relaxed and the increasing complexity of the simulator details is quite gradual. The phase started with a few lessons on general handling, before bringing in instrument flying techniques (some new, some previously covered in the core phase) such as holding, non-precision and precision approaches, SID/STARS (standard instrument arrivals and departures), circling approaches and much more. It felt good to apply these skills on an aircraft as big as the A320, and it’s fair to say that the main thing to get used to has been just how much quicker everything happens in this aircraft. Before long, we moved onto the Boeing 737 for two asymmetric handling (flying on one engine) and upset recovery flights before returning to the A320 for more upset recovery and a number of engine failure details. After a short break, we completed our week long CRM course, before returning to the simulator for lessons covering autoflight and route flying. CRM, which stands for crew resource management, is a huge part of aviation training and “focuses on interpersonal communication, leadership, and decision making in the cockpit”. It essentially focuses on the ‘people skills’ that are needed to operate successfully in todays flight decks, and we have been taught a number of tools and concepts which we will take forward to us into the airline. Each flight has also covered various A320 systems, from the various control laws and it’s protection systems to aids which help us in everyday flight such as the flight path vector and flight directors. Despite looking at these systems already, as mentioned earlier the entire phase has consisted of manual flying with autopilot only being used when briefing (such as in the cruise on our route flights), and the majority has been ‘raw data’, meaning that automation tools such as the flight directors have been off. The majority of the technical aspects of the aircraft will be covered in the Intermediate phase, but one thing that we have already come to realise is just how many seemingly small features there are which make flying it safer and in some cases, easier than older commercial aircraft. The phase culminated this week with our competency assurance flight which is a chance for us to put together the majority of the skills we have learnt over the phase into one flight. This CA flight is essentially the MPL equivalent of a traditional Instrument Rating exam, as both cover a number of the same procedures and flying techniques. Thankfully, all of us passed the CA flight which saw each of us fly one of three possible routes. My flight consisted of a setup and departure from Liverpool with a short en-route section to Birmingham where we joined the holding pattern and flew an NDB (non-directional beacon) procedural approach and go-around. For those who are unaware of what exactly this means, a procedural approach essentially consists of a number of steps which get you onto the final approach path for a runway. The use of an NDB makes this a non-precision approach, and shown below is the actual NDB procedural approach I flew on my CA flight. It is a relatively straight forward procedure which, after flying over the beacon (usually after flying the holding pattern), requires you to fly an outbound track to 7.0D (7 nautical miles from the IBM DME) before turning inbound to track 325 inbound to begin the descent at 5.1D. On the CA flight, the visibility was below minima which meant that we could not continue the approach and a go-around had to be performed. Despite the amount of times go-arounds come up in the tabloids as “dangerous and unusual events,” they are very routine and we get a lot of practice at them throughout our training. After performing a go-around, we were given an engine fire to deal with and, after completing our ECAM* drills we were radar vectored for a single engine ILS (instrument landing system) approach and landing. It was a very busy flight, but it felt good to complete it and bring together all of the skills we have been learning throughout the phase. *Oh yes, ECAM stands for ‘electronic centralised aircraft monitor’ which in an engine failure situation lists system failures and statuses, and displays the checklists which must be completed to correct the problem. Sorry for all the acronyms! It’s hard to narrow the past nine weeks down and choose a favourite part, but I have really enjoyed flying the procedures like the one shown above – I had come across these types of plates before starting the course but had no idea of what they meant! Now however, they seem very straight-forward and easy to follow and after seeing a Thomson 737 coming in to land at Birmingham on my drive home this week, I had to remind myself that I had just flown the exact approach they were flying! I have also really enjoyed getting to grips with circling approaches, and I’m very glad that we have had a chance to fly the Boeing 737 as well as the A320. However, by far the very best thing about the phase has been all of the manual flying time we have received in this magnificent aircraft! This is the main advantage to the MPL route, as compared to a short type-rating course we get much more time to fly the aircraft in a basic hands on format, enabling us to feel confident in flying it just like a ‘conventional’ aircraft before adding in the plethora of automatics. I will be sure to keep you updated on how the following phases are going. As usual, if you have any questions don’t hesitate to contact me. Thanks for reading! On the gate at Heathrow! 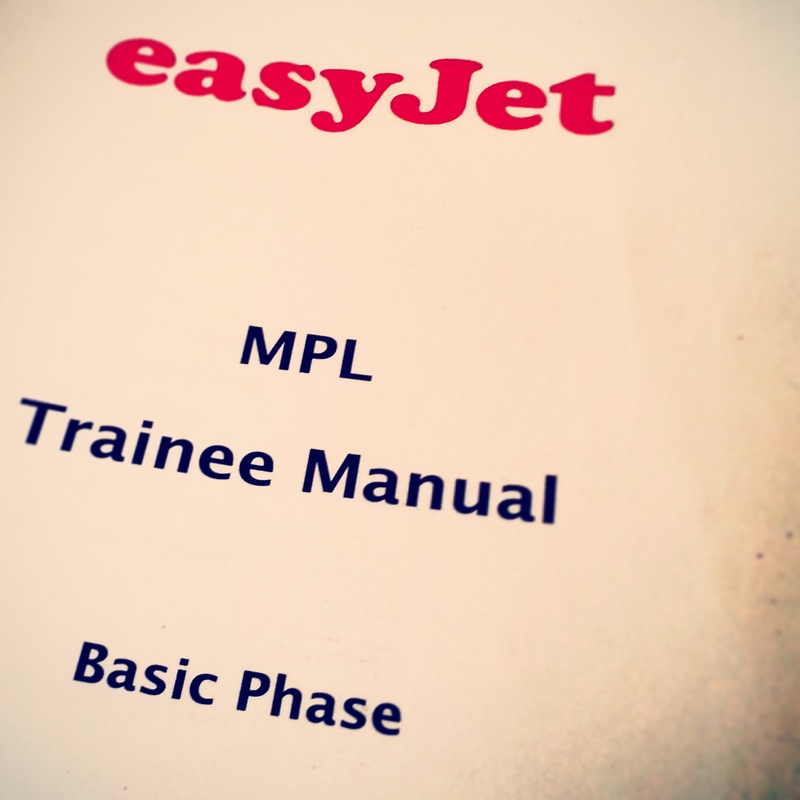 After one year in training, EZMP01 have finished the Core Phase of the EasyJet MPL Programme! The core phase was finished off with a four week training phase at CTCs Bournemouth training centre where we completed three upset recovery flights and five DA42 Twinstar flights (including one in the simulator). Upset recovery looks at how to successfully recover an aircraft from a stall or an unusual attitude, and has come to the forefront of aviation training following the crash of Air France 447 in 2009. We completed these flights in the Diamond DA40 and the Scottish Aviation ‘Bulldog’, both of which were great fun to fly! A lot of focus was placed on our flights in the DA42 Twinstar, in which we focused on further developing our IFR route flying experience and had an in depth look at asymmetric flight and engine failure procedures. Again, the Twinstar was brilliant fun to fly and was notably more powerful than the Cessna 172! It sure made for an enjoyable summer, and we even found the time to visit the beach every now and again.